I found a very interesting site that talks about the Chicago Outfit. Click on the highlighted Chicago Syndicate and go to the site. Sign up for updates. I am thinking I should figure out how to do this on my website. I have an interactive map on my Kansas City Mob Tour app. I should be able to do the same thing on my website. I have been researching for my next podcast. I have invited FBI (Ret) Agent Bill Ouseley to participate. We will discuss the relationship between and connection between Nick Civella, the Chicago Outfit and the Kansas City Outfit. One thing I learned is the relationship between Chicago and Kansas City started before Nick Civella was of any importance. 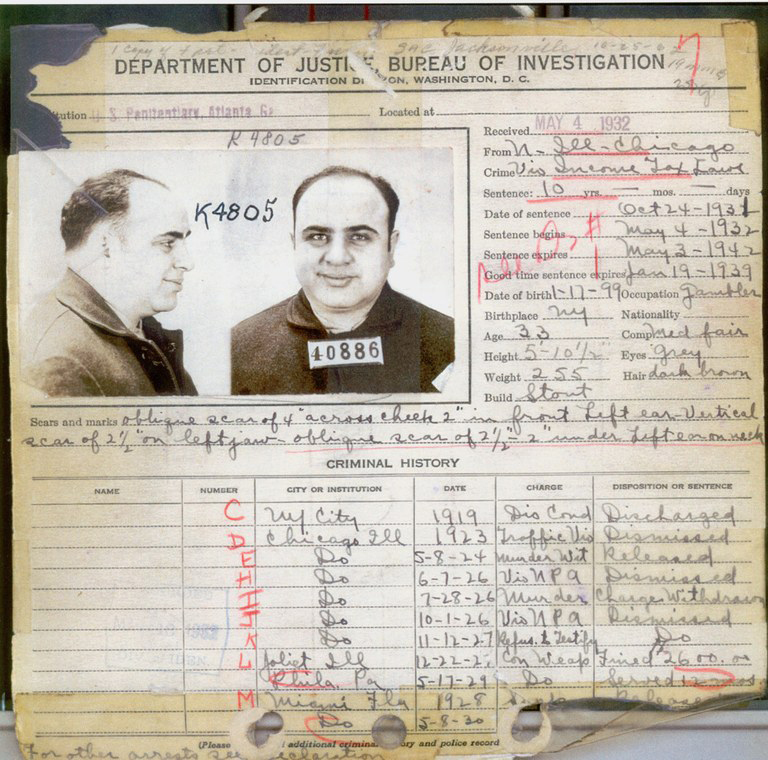 Al Capone was a frequent visitor to KC. During the 1920s and 1930s, the Bellerive hotel at 214 E. Armour boasted a parade of famous guests: actress Mary Pickford, silent-film actresses Lillian and Dorothy Gish, contralto Marian Anderson and Scarface Al Capone stayed there. Stars like Billie Holiday, Duke Ellington, Tommy Dorsey, Liberace, Bob Hope and Jerry Lewis performed at the hotel’s swanky Casbah nightclub. Old Scarface was also known to vacation at the famous Elms Hotel and Resort in Excelsior Springs, Missouri. 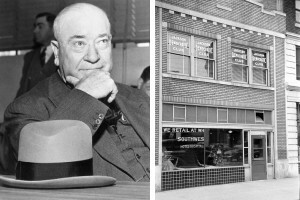 Al Capone also stayed at the Rieger Hotel, 20th and Main. The Rieger has been preserved and currently contains a upscale bar and grill. the owners have created a special blend whiskey named J. Rieger & Company. With the Chiefs heading for the playoffs, I think back to the 1969-1970 season. The KC Chiefs were headed to the Super Bowl against the favored Minnesota Vikings. Nationally, the Vikings were getting all the action to win. Locally, the money was going down on the Chiefs. Nick Civella called the tapped North View Social club’s phone. 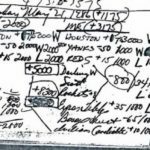 This was the clubhouse known as “The Trap.” The main bookies, Dude Fontanello and Frank Tousa were worried about the “Book” being out of whack. Dude noticed too much local money going down on the Chiefs. They needed to “lay off” the Chief’s action to another city. At another city like Chicago or Minneapolis where there would be more money down on the Vikings. You see, the Mob does not gamble with the “Book.” They equalize the number of bets on each team in any given contest. The losers pay the losing bet and a 10% “Vig” to the bookie. The winner gets his win while the Mob keeps the “Vig.” Vig is short for vigorsh. 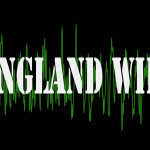 On November 5th, 2015 Aaron Gnirk and I filmed a live recording of our Gangland Wire Crime Stories podcast program. We set up at the Uptown Arts Bar, 36112 Broadway, KCMO. We had Terence O’Malley, Producer of Blackhand Strawman and Tom and Harry. Our topic was the influence of the KC Organized Crime element on local politicians. Here is a video of that show. My Oklahoma friend, Richard M. Mullins, has released his true crime book on Oklahoma criminals. What first drew my attention was his chapter on the James S. “Jimmy” Duardi attempt to take over the Grand Lake area and open it up to illegal gambling, prostitution and other criminal behavior. So, if you want the definitive book about a crew of dangerous Oklahoma criminals, click here . Black Mass is the type of story that I call, “You can’t write this Sh$t,” this has to be lived. Johnny Depp, as James “Whitey” Bulger, has the dead eyed soulless persona down. 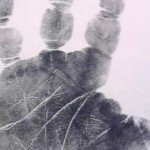 I have met two other men in my life like this, and when they looked me in the eye, they were devoid of any human feeling. I can recommend this film for that alone. The true crime fanatic has another reason to see this narrative film. 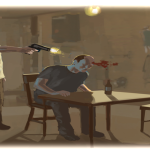 Screenwriter, Mark Mallouk’s depiction of F.B.I. agent John Connolly as James “Whitey” Bulger’s informant handler was so true to life, it was scary. Australian actor, Joel Edgerton, captured the personality of a man in over his head at work. He became that ego maniac with an inferiority complex whose reach has far exceeded his grasp. As a young policeman, I learned that smart and capable professional criminals often become “informants” and use their handler’s egos to achieve their own criminal goals. It takes a strong personality and self discipline to control them, Connolly had neither. Screenwriters Mark Mallouk and Jez Butterworth were able to capture the subtle intricacies of that type of relationship. The one thing that did not ring true (for me, it is important that a true crime story is believable) is the scene where Whitey has an interaction with Connolly’s wife. The only other problem I had with the film was, there is no “good guy.” But, the story was so compelling and well acted, I can forgive them. 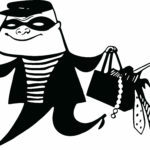 In the subculture of real cops and real robbers, many times there is no real good guy. Mark Mallouk is from Prairie Village, Kansas which means he probably attended Shawnee Mission East High School. Mallouk graduated from the University of Kansas with three degrees; a BA in Economics, a BA in Psychology and a BA in Human Development. He then attended Pepperdine University and obtained a MBA. He was bitten by the film bug in L.A. and completed the Professional Program in Screenwriting at the UCLA Graduate School of Theater, Film and Television. 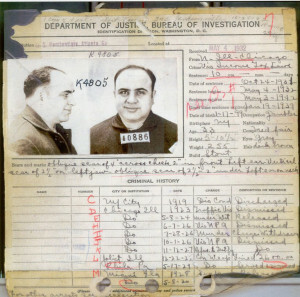 Mallouk is working on a screenplay about Frank Calabrese Sr and the crime family he ran out of Chicago that was known as The Outfit. 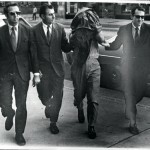 Frank Calabrese Sr. was a vicious mob extortionist and killer. I met his son, Frank Calabrese Jr. at the 2013 Las Vegas Mob-Con. He is the co-author of Operation Family Secrets, the true story of how a father pushes his son into the mob and what happened to bring Calabrese Jr. to the point that he wore a wire on his own father. This is another compelling mob story that should be made into a movie. Frank Jr. helped bring down his own father for involvement in 13 gangland murders as well as other crimes. 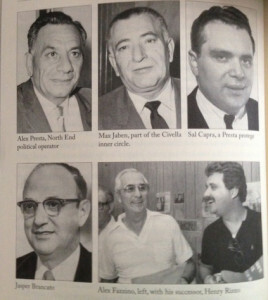 In 1929, John Lazia owned a luxurious dinner club and casino called the Cuban Gardens. Like the Mirror Lake County Club and the Riverside Race track, this club was located in a rural area, north of the Missouri River. It was very close to the Race Track. Lazia required customers to be formally dressed. Like any respectable speakeasy, a new customer had to have a connection to gain admittance. The staff was all sharply dressed. A close look at some revealed a gun in their waistband. The entertainment was always a big band, usually playing swing or Latin dance music. Andy Kirk was a 1930s era jazz musician and leader of the nationally known, Clouds of Joy. Kansas City’s famous pianist, Mary Lou Williams was a member of this band. Chuck Haddix in his book, Kansas City Jazz – From Ragtime to Bebop, recounts a Mary Lou Williams’ story about the band’s brush with Kansas City’s dark side of the jazz scene. The band was playing at the Cuban Gardens. Andy Kirk was playing tuba while the lead singer, Bill Massey, was conducting the band. Bill Massey got into an argument with the club manager. Ms. Williams described him as a “hood” who said, “You guys better pack up fast, the rest of you are too nice for me to kill Massey.” She reports they packed up and left. The Clouds of Joy resumed playing at the Pla-Mor, a large ballroom located at Linwood and Main. An interesting fact is that the Cuban Gardens was located just inside Clay County, about 1/2 mile east of the Platte County Line on 9 Highway about where the current Broadway Extension crosses over 9 Highway. This is about 1 mile west from the KC Waterworks plant. The Riverside Race Track was probably less than a mile west into Platte County. The old Cuban Gardens site was completely wiped out by new construction of 9 Highway by 1970. 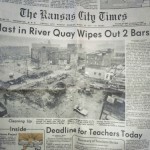 See the facebook site On the Spot Kansas City (History of KC’s criminal past) for aerial photos. Tom Pendergast had a long time interest in horse racing. William H. Reddig, in his book “Tom’s Town”, explains how horse race betting became legal. The Supreme Court interpreted a law that declared the “certificate” form of betting in a horse race was legal. This meant that a race fan could “contribute” some money to “improve” the breed. Soon a group of Pendergast associates formed the Riverside Park Jockey Club and took over a Riverside, Missouri dog track. This became known as Pendergast’s Track. Local gamblers saw an opportunity in opening a gaming casino close to the track. Mr. Heddig reports that a Kansas City gambler named Jake Feinberg opened the Green Hills Club in the area. This was soon closed by Platte County Presbyterians. 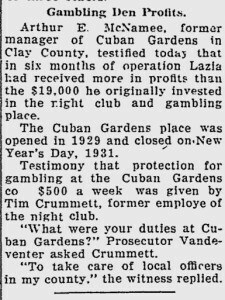 Shortly after, just over the Clay County line, Johnny Lazia opened the Cuban Gardens. Phil McCrory, a Pendergast associate, advanced $12,000.00 to Lazia. In an interesting side story, in 1922, the Drover’s Bank in the Livestock Exchange building was robbed of $100,000.00. The money was never recovered. The suspects were found to be St. Louis criminals. The getaway car was found. This car was stolen from Phil McCrory and left within 50 feet of where it was taken. 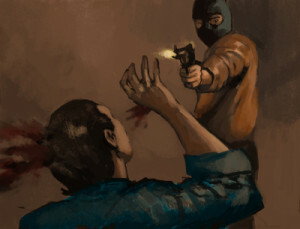 A subsequent investigation caught the bandits and there never was any known connection to Pendergast or McCrory. When Lazia opened the Cuban Gardens in Clay County, the open gambling was soon attacked by the Ministerial Alliance of Liberty. After several raids by the Clay County sheriff, no evidence of gambling was found. In Tom’s Town, Mr. Heddig reports Lazia kept armed guards at a small gatehouse to admit the autos of Customers. Inside the club, the gambling was like that in the back of Rick’s in the film, “Casablanca.” The actual casino was in a back room closed off to the restaurant and guarded by armed men in evening clothes. It is reported many of the elite Kansas City folks frequented this club for the great food cooked by chefs imported from Europe. This clipping tells how they were able to avoid Clay County law enforcement. The Cuban Gardens closed on New Year’s Day in 1931. 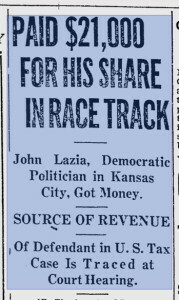 John Lazia would be the victim of a Mob execution in 1934. Tom Pendergast’s reign will end in prison in 1939. Retired F.B.I. agent William Ouseley wrote in Mobsters In Our Midst, ” On December 13, 1959, a 25th wedding anniversary party was held for Nick and Kathrine Civella at the Mirror Lake Country Club . . .” Agent Ouseley goes on to report that 500 to 1,000 guests came and went during the evening. What is important to remember is that this was 2 years after Nick Civella was discovered at the famous Mob meeting in Appalchin, New York. By this time, all of Kansas City and the nation knew the importance of this Mob meeting and Nick’s participation. Nonetheless, in attendance were the following Kansas City politicians; City Council members Tom Gavin and Sal Capra; State Senator Jasper Brancato; ward politicians Alex Presta and Henry McKissick; Jackson County Administrative Judge Hunter Phillips; and Lyman Field, President of the Kansas City Board of Police Commissioners and long time friend of President Harry Truman. A subsequent investigation revealed that purchases of liquor were not from any separate ‘liquor pool’ account but that they were made from a general account fund maintained by the Osadchey partnership. A 1959 investigation revealed they were actually buying the cases of booze from Broadway Liquors. The owners of Broadway Liquors were Marco M. Filardo and Victor J. Vogliardo. “Eddie Spitz” was subsequently convicted of a conspiracy to avoid the federal laws on the sale of alcohol.